2011-2012 Holiday Tournament of Touchdown Shots! There have been thousands of touchdowns scored in the NFL and we have had the opportunity to capture many of them on film. Now we want you to act like a filmmaker and help decide which of these shots is best! 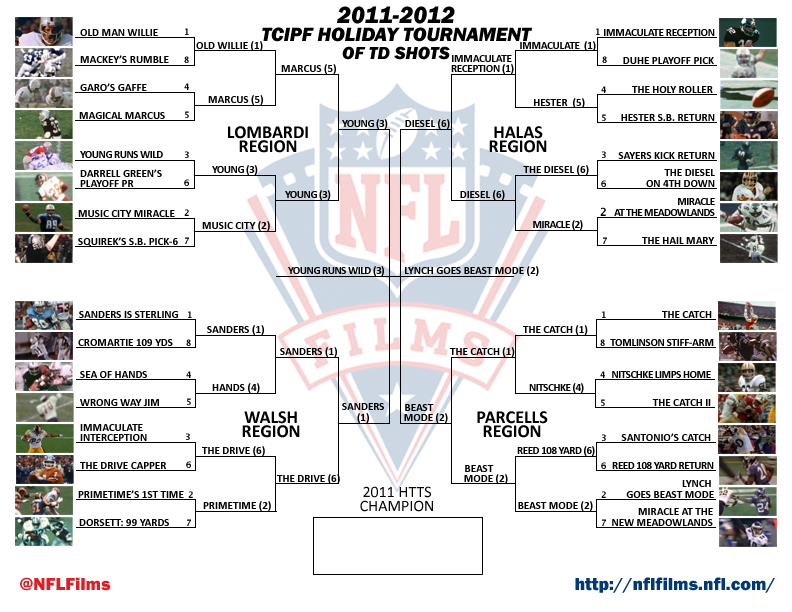 The TCIPF Selection Committee chose 32 iconic touchdown shots from our library and laid them out in bracket form. Click the bracket above, print it and fill in your picks! Every few days, we will post videos of a match-up of two touchdown shots. Watch them and then vote on the best shot! Remember, this is not the best touchdown, but the best shot. So look at the framing (can you see everything you need to see? ), the composition (is it too dark? too light? ), and the movement (is it too shaky?) as opposed to how memorable the play was. We want to know what YOU think is the best!